Free... Yes That's right! a FREE First Aid Kit with every order!!! Who doesn't want something Free? How do you get one? No problem! Order by phone! You can a free first aid gift when you order ANYTHING from our site! Here's how it works... Just call the toll free number above to place your order (and to hear about other great "lower than online price" deals currently being offered) ask the Customer Service Representative assisting you to "add" the free first aid kit to your shopping cart... you'll receive your free first aid item with your order! Not quite at the level for the next larger free first aid item? Check out our First Aid, CPR & Safety Products on Sale! FREE First Aid Gift with Order! What kind of First Aid Kit do you get for FREE???? 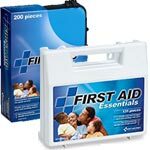 Large or Medium All Purpose First Aid Kit. Large or Medium First Aid kit. Perfect for use in the home, auto, sports. Ample room for personal medications. Free item chosen by us, based upon stock on hand. Great Free First Aid Kit! ***Suggested Retail $16.99 to $24.99 FREE with your order of $75 or more! All Purpose First Aid Kit. Our popular FAO-106 Travel Size Mini first aid kit for purse, briefcase, or backpack contains bandages, antiseptics, medication and first aid guide. *Suggested Retail $2.29 FREE with your order of $25 to $74! Surprise First Aid Kit or Product. We'll choose for you...each order under $25 will receive our choice of a quality First Aid Product or Item from our site. $?.?? FREE with your order of less than $25! NOT AVAILABLE FOR ONLINE ORDERS - CALL TO PLACE YOUR ORDER TOLL FREE TODAY! Free First Aid - Really! 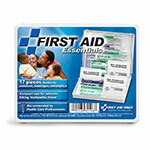 This First Aid Offer subject to change or substitution at the discretion of First-Aid-Product.com, limit one free First Aid Item per order, per customer, per week. Breaking your order up into multiple orders will not result in garnering extra free kits... we will combine the orders and send one free item. Free First Aid Items cannot be added after order is complete, and are only available for phone in orders. This is your incentive to call and speak to our friendly, helpful, and knowledgeable Service Department! We love offering this great special to our clients! To keep this offer available to our thousands of regular clients, we reserve the right to cancel, without notification, orders placed by individuals attempting to take advantage of the system with multiple orders from the same account or IP address, breaking up orders for multiple free items, etc. (Besides, if you break the order up into multiple order, you pay more shipping) ~ If you have a question about acceptable use and/or exceptions to this offer, please feel free to call us toll free! Enjoy our FREE First Aid Item Offer! Offer valid while supplies last. This free first aid item offer cannot be combined with other discounts or offers.